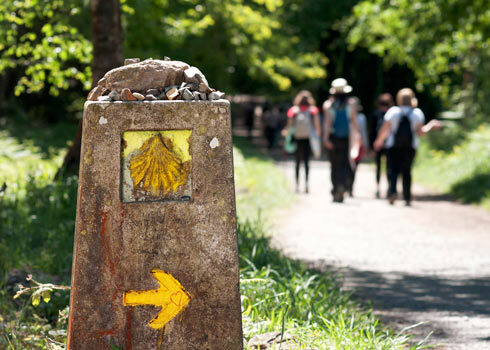 El Camino de Santiago is one of the oldest Christian pilgrimage routes in the world. But it’s more than just a road. It is an opportunity to reflect on life, go on an adventure, exercise, make new friends, listen to the voice of God, and experience nature’s beauty. The journey is as important as the destination. 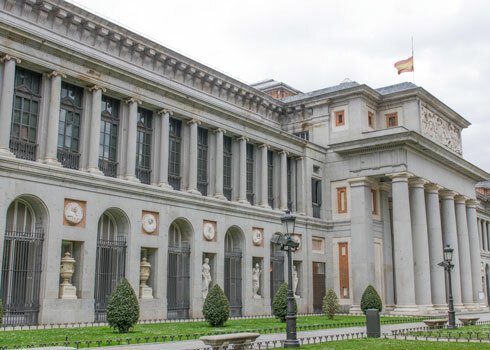 Located in central Madrid, the Prado Museum features one of the world’s finest collections of European art. See thousands of paintings, sculptures, prints, drawings, and more, including Diego Veláaquez’s famous Las Meninas. Like hundreds of thousands of pilgrims before you, you will end your pilgrimage at the Cathedral of Santiago de Compostela. Celebrate Mass, and see captivating pieces of art, the dazzling statue of St. James, and the crypt with St. James’ relics. Depart the United States for your overnight flight to Madrid. Dinner and breakfast will be served on board. After arriving in Madrid, you will be transported to your hotel to check in and unpack before joining the other pilgrims for a tour of Spain’s capital city. See the Royal Palace, the Plaza Mayor, and the Prado Museum. Dinner will be at the hotel. Have a restful night—our walking begins tomorrow! After breakfast we will begin our walk in Foncebadón. We will pause at the Iron Cross, a common place for pilgrims to leave a stone to symbolize a sin or burden they are leaving behind. We will continue on to O Cebreiro, a breathtaking mountain village, and end the day in Sarria with dinner and overnight. Following breakfast we will pick up our Pilgrim Passports and set out for Portomarín, an old town on the banks of the Miño River. See the Church of St. John of Jerusalem, which was strategically put along the Camino route to protect the tomb of St. James. We will enjoy dinner and overnight in Portomarín. After breakfast we will walk through fields, forests, and granaries to Palas de Rei. Here you will have time to explore the town on your own or make an optional visit to the Monastery of Vilar de Donas, a sixteenth-century monastery containing coffins of knights of the Order of St. James. Dinner and overnight will be in Palas de Rei. Following breakfast we start the trek to the small, bustling town of Arzúa. On the way, we will stop at Melide to visit Sancti Spiritus Church, the small chapel of San Roque, and the Church of Santa María. We will pass through the province of A Coruña, cross the Iso River, and visit the Chapel of Magdalena. Dinner and overnight will be Arzúa. Just like God rested on the seventh day, we will take a break. After Mass, spend time reflecting on your journey thus far and enjoy the day in carefree timelessness. Feeling re-energized, we will begin our 11-mile walk to Arca O Pino, the largest community before Santiago. We will stop for a picnic lunch along the way. In Arca O Pino you will have time to explore and take an optional visit to the Monastery of Sobrado, a monastery dedicated to Mary. Dinner and overnight will be in Arca O Pino. After breakfast we will start the last 14 miles of our journey. To break up the trip, we will have a picnic lunch on Monte del Gozo. After arriving in Santiago de Compostela, we will check in to the hotel and have time to explore this capital city. Dinner and overnight will be in Santiago. After breakfast we will celebrate Mass at the Cathedral of Santiago de Compostela. Here you will find captivating pieces of art, the dazzling statue of St. James, and the crypt with St. James’ relics. After Mass you will have time for lunch before the group tour of the city. Spend the rest of the afternoon as you wish until our final group dinner. After breakfast say “hasta luego” as the bus transports you to the airport for your flight home. Sometimes we need to step back from life and take another look at who we are, what we are here for, what matters most, and what matters least. Without the distractions of your everyday life, walking the Camino de Santiago is a perfect opportunity to hear the voice of God. 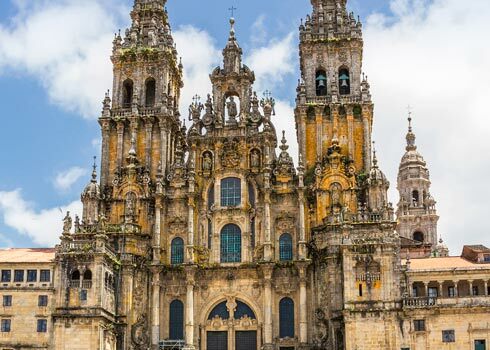 Follow in the footsteps of the apostle St. James as you take a 75-mile trek over Spain’s high plains and hills, through fields and forests, on your way to the Cathedral of Santiago de Compostela. See the Iron Cross, celebrate Mass in historic churches, and explore Spanish towns and villages.